CaviWipes are durable, nonwoven, nonabrasive towelettes that presaturated with CaviCide. 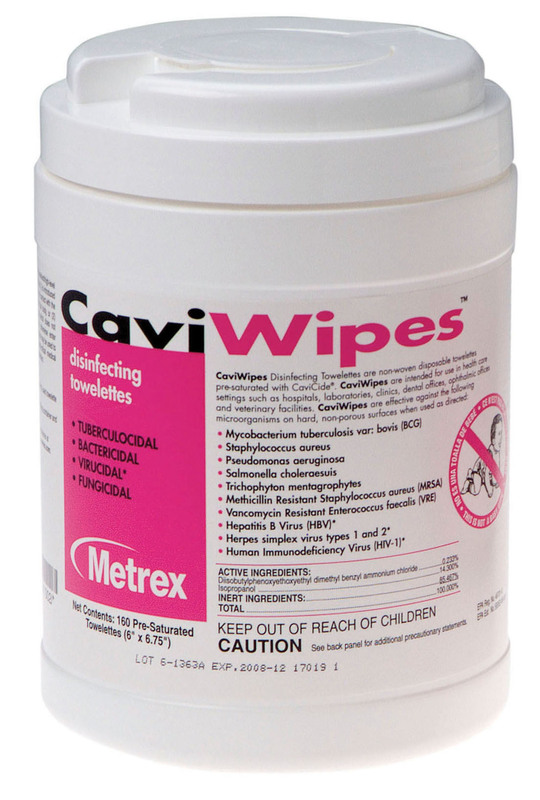 CaviWipes are a cleaner and disinfectant in one. They are recommended for use on non-porous surfaces and fixtures. CaviWipes are ideal for operating rooms, surgical centers, neonatal units, medical and dental operatories and other critical-care areas. CaviCide is a convenient, ready-to-use, intermediate-level surface disinfectant that is effective against TB, HBV, HCV, viruses (hydrophilic and lipophilic), bacteria (including MRSA and VRE) and fungi. It can be used in the NICU, operating rooms, isolation rooms, patient care areas and laboratories. When used as directed, it will also effectively clean and decontaminate critical and semi-critical instrumentation. CaviCide is safe for use on non-porous surfaces. It is ideal for cleaning and decontamination of environmental and medical device surfaces. Metrex Research works to provide value-added consumable products and services in global healthcare environments. We offer a complete line of high-quality enzymatic detergents, high-level disinfectants/sterilants, surface disinfectants for use in hospitals, liquid medical waste disposal products, hand hygiene products, eye shields and MRSA infection prevention products. Our products are specifically designed for healthcare markets such as acute care, primary care, ambulatory surgery centers (ASC), EMS/Fire/Police, extended care, and the public sector.